Consisting of both an online portion and an app for iOS or Android devices, ArchiSnapper allows you to collect information while on site and quickly and easily assemble it once you’re back at the office. The truth about that question is the vast majority of architects actually are, despite the profusion of new mobile and cloud-based digital tools. What architects need to do to turbo-charge their workflows is actually move from the era of the desktop (productivity) to the era of connectivity (social internet). By doing so architects can get out of the habit of producing data that sits in distinct, unconnected silos where flexible access and intelligent collaboration don’t actually exist. The ArchiSnapper workflow is simple. You go out to the job site to observe construction progress. Leave your camera and paper notepad at the office. Instead, with a tablet or smartphone (iPad for example), you photograph, draw, sketch, annotate and comment all from your mobile device using ArchiSnapper. With ArchiSnapper your data is organized, digitized, and securely and wirelessly synced between your device(s) and the cloud; available for collaboration with anyone across the world using their smartphone, tablet or PC. There is no need to struggle with USB sticks or cables. To start using ArchiSnapper, add projects in the online portion of the tool. Insert the address and details of the project and also link some contacts—and then head out on your site visit. Simply take your mobile device, with the ArchiSnapper app installed, and you can download projects and begin a new report on the move. 01 – ArchiSnapper screen shot, in Portrait mode on an iPad. 02 – ArchiSnapper screen shot again. Again in Portrait mode. Each report allows you to put in the status of the project, draft a PDF report onsite and add as many observations as needed, notes, photos, quick sketches and assign people. Once the site visit is complete, you simply sync your mobile device with your online account; when you return to the office, all the information is saved online, ready to be turned into a PDF document at the click of a button. 03 – ArchiSnapper screen shot showing how to highlight an issue on site using the mobile device’s camera to take pictures on site. 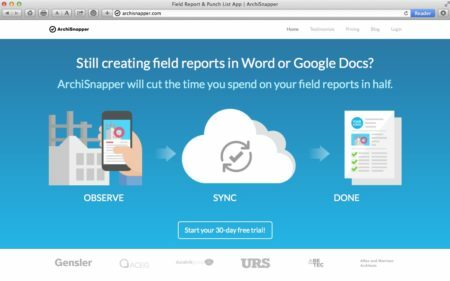 With this simple system, ArchiSnapper can save architects hours of time on field reports. To learn more about ArchiSnapper visit them online here. To learn more about available mobile tools, specifically for iPads, visit our Ultimate iPad Guide: Apps for Architects 2.0 guide.